Social work and society: downward spirals and double-binds? We have argued that the value of psychodynamic and systems theories lies in the framework they provide for understanding themes, patterns, events and defences, and in the practice techniques through which this understanding may be applied. In this and subsequent chapters we intend to demonstrate the validity of this viewpoint, beginning here with social work’s interaction with, and relationship to, the larger systems within which it is located: social services organisations, public and societal expectations, and the political context. Social work is located within a social, psychological, economic and political frame or context which frequently appears to render social work an unloved and challenging (if not impossible) profession. 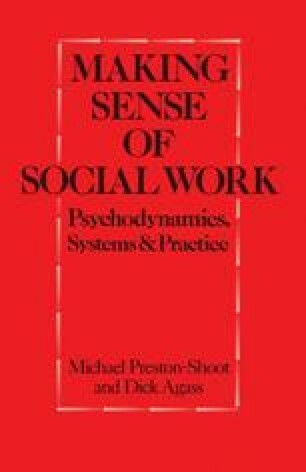 This chapter is an attempt at a meta view, an examination of how social work’s complex psychological, political, organisational and social inheritance affects practitioners, and how they might intervene and practise strategically in it, using the contribution which psychodynamic and systemic thinking can make.